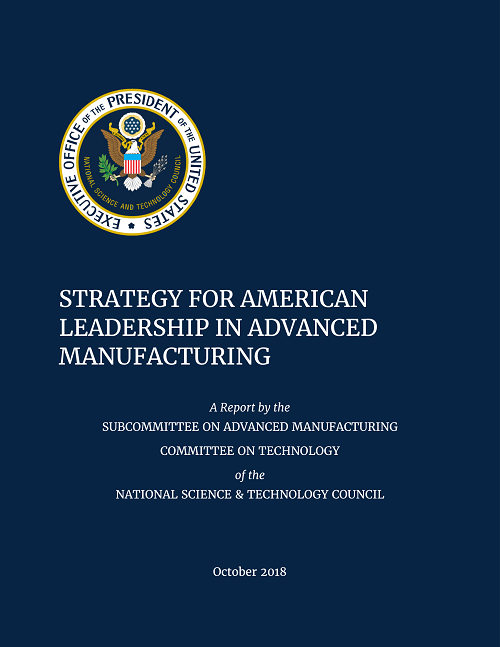 Today, the White House released the quadrennial Strategy for American Leadership in Advanced Manufacturing, which is based on a vision for American leadership in advanced manufacturing across industrial sectors to ensure national security and economic prosperity. Each goal is supported by a number of strategic objectives and specific research and development or program priorities, with each priority including specific actions and/or outcomes to be accomplished over the next four years. Although this is a Federal strategic plan, accomplishing the goals and achieving the vision will require the participation of State, local, and Tribal governments, the full spectrum of educational institutions, companies both large and small, the investor community, and, most importantly, America’s manufacturing workforce. The strategic plan was developed by the National Science and Technology Council, Subcommittee on Advanced Manufacturing, with significant input from industry, manufacturing associations, technical associations, other organizational stakeholders, and members of the public obtained through a Request for Information supplemented by numerous roundtable discussions hosted by NIST and different stakeholders across the country.